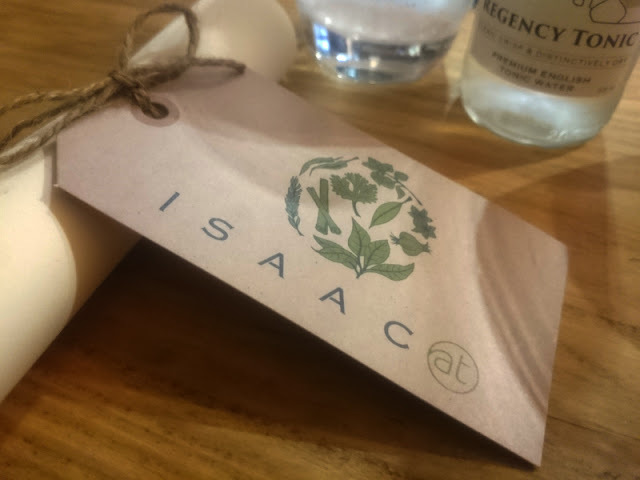 I visited Isaac At for the first time last March and was suitably impressed with the quality and detail of the meal. Since then they have undergone some internal refurbishing and the place is looking smart and tasteful. So what else has changed? The kitchen is bigger (yet still bijoux by most standards) and there are a couple of places at the pass in addition to the larger dining area. Interestingly the tables have been set away from the kitchen and service is now staggered by table rather than served all at once to the room. Also the announced introductions to the courses have been ditched, which I'm kind of thankful for. Despite being interesting if you were geeking out on the food, it disjointed the evening for diners that had to cull their conversations at each course. I'm still impressed by the young team here (who seem even younger...or I'm looking older!) who diligently work away during service, weaving around each other seamlessly in the open kitchen. It's quite some performance and if you are interested in the the theatre of the food, I suggest you snag the seats at the pass like us. Everything is sourced as local as possible. 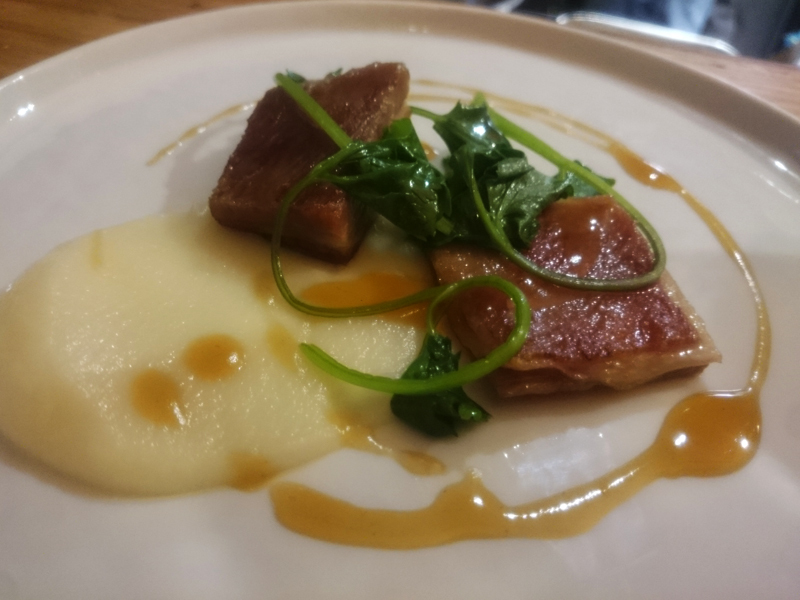 The mileage of every ingredient and wine is listed on the menu which is two fingers up to the majority of restaurant menus that use the caveat "locally sourced where possible". (I was once shown a picture of a delivery of one place that particularly bleats on about this, but how local Spanish honey and Heinz sauces, are I'm not sure*). The food here is very special and the meal even more refined and polished since my last visit. It was impressive before but the whole experience just seems more confident. 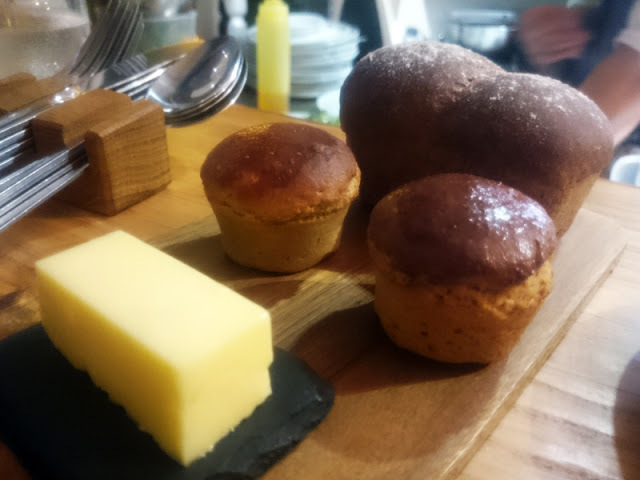 The breads have even been tweaked a bit - the little treacle and stout loaf had a deep, rich flavour and the caramelised onion brioche was light and sweet. We stated with a feather-light Brighton Blue cheese mousse, pickled walnuts and pear. This was a great start. The textures from the mousse with the crisp pear slices and the contrast of the the sharp pickled walnuts made it a real treat to eat. 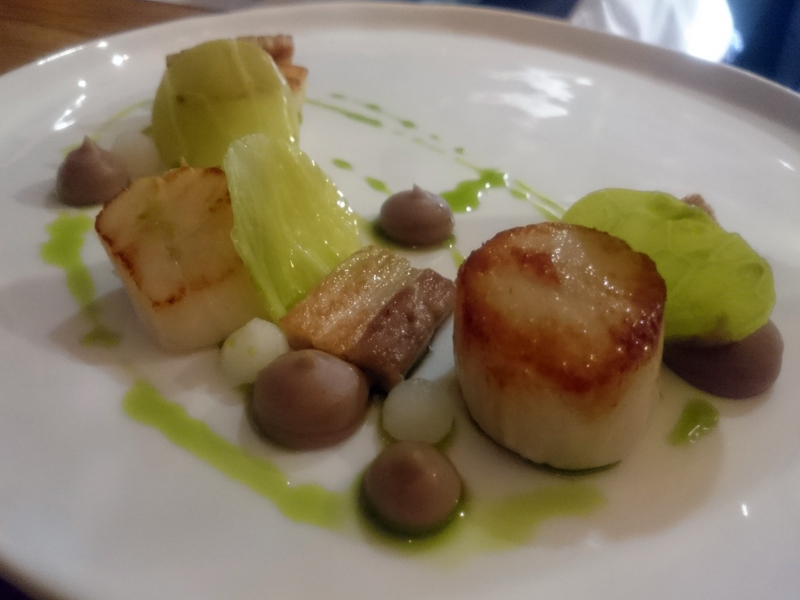 The scallop dish was so pretty with the little pearls of kholrabi and the perfect circles of January King (cabbage to you and me). Scallops, despite being delicate, can take a strong hit of flavour and this came in crisp slices of pork belly. The only thing I wasn't sure about through the whole meal was the chestnut puree on this dish. The muddy, mellow flavour didn't really add anything to the plate other than a nod to the festive season. The lamb belly in the next dish had been cooked in a water bath for two days. The texture was so interesting; crisp, thin layers of lamb alternating between gelatinous, silky slithers of fat. Standout was the venison though - by far the best venison I have had for a while, possibly ever. The loin was so succulent, sweet and tender. The pressed terrine was a nice thing to add for interest too. I bloody love beetroot and the "ketchup" they had made with it was softly spiced - so good with this meat. This menu was intended as a Christmas menu (but available into January) and this was a really elegant festive dish. 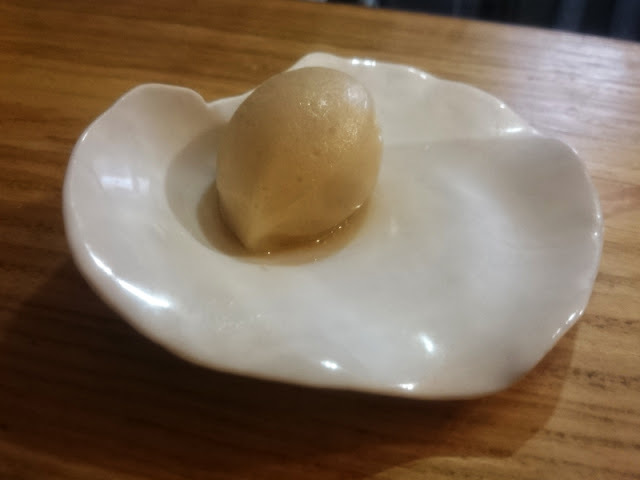 Can we take a moment for the mulled cider sorbet? Sat like a pearl in an oyster shell you had to admire it for a while, but it was as good as it looked. I think they used sumac (amazingly foraged in Brighton somewhere) and peppercorns and the mulled flavour was intense and fresh. I could easily have eaten a bucket of this. 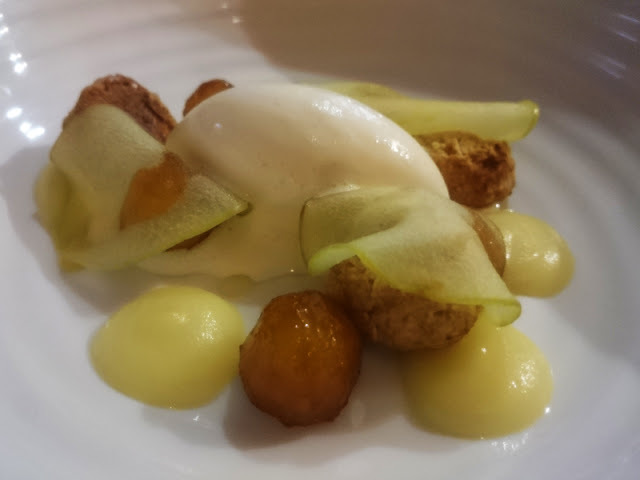 We finished with caramelised apples, oat clusters and a very subtle cinnamon ice cream. There is still a trend for breakfast as dessert and the honey oat clusters certainly tipped it that way. Mornings would certainly be brighter with a buttered apple puree like this one over my porridge though. 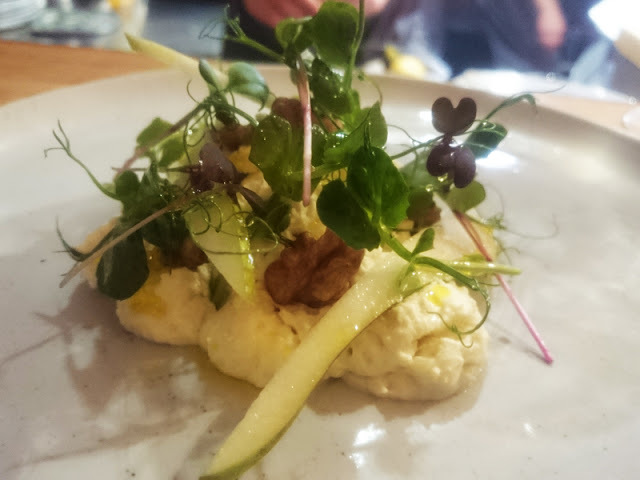 The dinner was punctuated with a disc of fennel shortbread with burnt apple puree and an almond, burdock and sumac drizzle cake which was the perfect end to a fantastic meal. You can order the full tasting menu for £47pp or have a slightly streamlined set menu at £35pp which misses out one of the main courses and the sorbet. For what you get and the care and attention to the food, you can't argue with the prices at all - well worth it. Interestingly they offer a juice pairing (£20) as well as the alcoholic kind (£29) which is something I don't think I've seen before. All juices are created in house and a great idea for drivers, tee totallers and pregnant (I had NO IDEA what the hell to drink when I was). Wines are a real celebration of local vineyards - Ridgeview (of course), Bolney, Sedlescombe, Davenport, Nyetimber...they're all here. The same goes for the rest of the drinks menu, including the spirits (bar the whisky) and even the bottled water. Isaac At is one of the many gems we have in Brighton. The dining scene here is pushing harder and harder in terms of quality, variety and experimentation and it's great that the city is getting national recognition for it. For a really special meal, either as a treat or occasion, Isaac At should definitely be a strong consideration. I dined as a guest of Isaac At. Words and thoughts, as always are my own. *They will remain nameless. You know who you are! 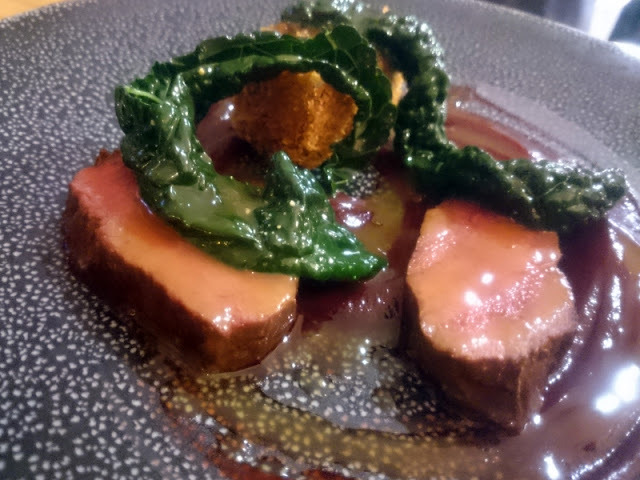 Labels: blackbook, brighton, fine dining, restaurant, review, special occasion.